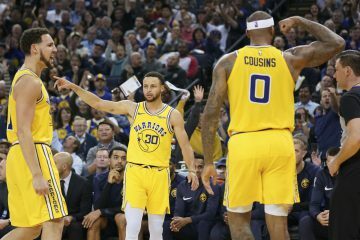 After surrendering a 19-point fourth-quarter lead to the Memphis Grizzlies in a dispiriting January loss, the Golden State Warriors made sure to hold onto a 23-point advantage on Friday night in FedEx Forum. 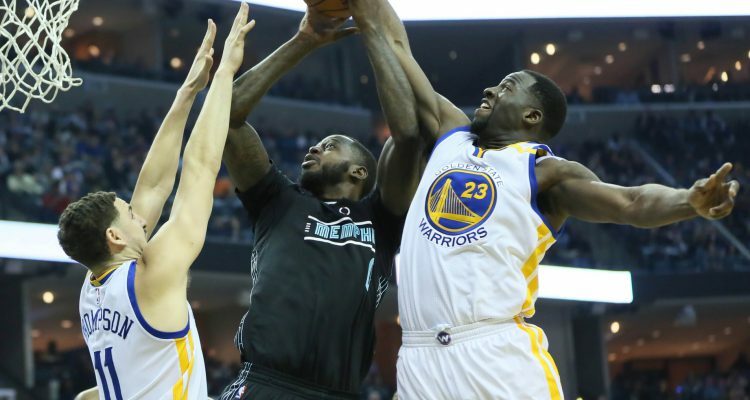 Led by the all-around brilliance of Draymond Green, who collected a rare triple-double without scoring double-digit points, the Warriors earned their first victory against the Grizzlies in three attempts this season. Golden State moves to 45-8 and face Kevin Durant’s former team in Oklahoma City in less than 24 hours. 1. If you know of a better 4-point performance in the history of the NBA than the one Draymond Green just had, please share with us the YouTube evidence. Dray dominated this game from the jump with his relentless defense on the burly Zach Randolph and Marc Gasol, helping to force the duo into a combined 9-of-23 shooting with six turnovers. 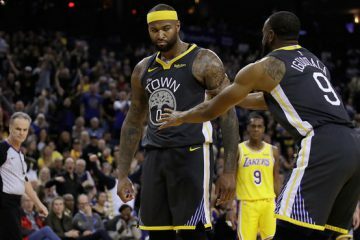 He was also decisive and efficient in orchestrating the Warriors’ offense (10 assists to 2 turnovers) and made sure through sheer will that his squad wasn’t going to drop three in a row to the Grizzlies on his watch. Sometimes you can just tell when a player won’t allow his team to lose and this game was one of those times. That this workman-like performance came against Memphis just goes to show that no one is going to out grit ‘n’ grind Number 23. 2. The Warriors have had a few jaw-dropping statistical achievements this year (Steph’s record 13 3-pointers in game, Klay’s 60-points in 29 minutes to name two), but the most remarkable feat might be this 4-point triple-double. Dray collected 12 rebounds, 10 assists, 10 steals, five blocks and four points for the first triple-double in league history while scoring single-digit points, per ESPN. 3. Klay Thompson wasn’t too shabby either. Dude hit three 3-pointers in the game’s first four minutes to set the pace early and finished with 36 points on 23 field goal attempts. In five February games, Thompson is averaging 26 points while shooting 52.8 percent from distance and 48 percent from the field overall. 4. The power of JaVale: Dude even makes Klay a willing passer. Look how happy the guy with the career 2.3 assist average is to lob the ball to McGee. 5. 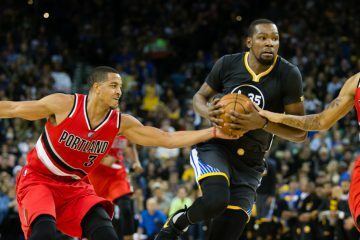 Too bad JaVale can’t be a little more disciplined on defense, if he could, we’d be treated to many more of his oh-my-goodness! jams per game. Marc Gasol got him to bite on pump fakes twice for easy scores down low. 6. Gah damn! Look at that range. 7. Andre Igoudala had one of his finest offensive performances of the season to lead the second unit with 22 points on 6-of-7 shooting. After a slow start, Andre has quietly gotten his shooting percentages right where they’ve always been in his Warriors career, and he’s even hitting free throws at his best clip in six years. 8. 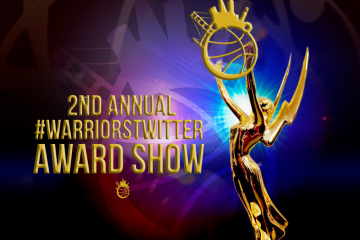 The joy on this Warriors team is palpable. Briante Weber hasn’t been on the team for even a week, yet look how happy the bench is for his exaggerated Euro-step and-1 bucket. 9. Kevin Durant’s three-point shooting has been off (5-of-29 in the pervious five games) but he hit half of his six attempts to help him net 24 points. That’s a good sign before the emotional matchup with OKC coming up. 10. Time and time again, when these Warriors feel they need to win a game, they always come up with timely, brilliant performances like this one. That’s why the game against Russell Westbrook and the Thunder in Oklahoma City is going to be so much fun to watch. Which is going to win out, the anger and venom in the stands and on the bench of OKC or the brotherhood and resiliency of this all-together Warriors team? This NBA season has been so great: it’s a mid-February game that will probably have very little meaning in the standings, but I cannot wait to see how it all plays out.